Richard Smith, technical advisor to this grant, has been active in providing advice and some lab equipment to this project. Other faculty at the University of New Hampshire have also reviewed the preliminary results of this project. In 2013 the primary tasks were to monitor forage productivity and manage rotational grazing on the site. Due to the very wet spring and early summer cattle were excluded from the site to minimize impacts to tree roots in wet soils. In mid-August cattle were allowed to graze each silvopasture and open pasture treatment. An estimated heard weight of 9,400lbs was allowed to graze each ¾ acre plot for two days, which allowed forage to be reduced to 2 inches in height. 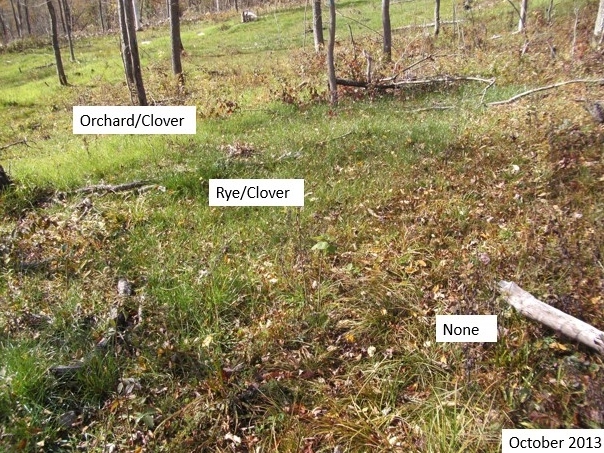 Prior to grazing, forage samples were collected in each forage strip of the main plots. These were then oven-dried and weighed. This study and the 2013 results were presented as part of larger silvopasture presentations at the following conferences/meetings in 2013: Maine Organic Farmers Farmer to Farmer Conference, Society of American Foresters National Convention, and a public presentation at The University of New Hampshire. The project was well received. 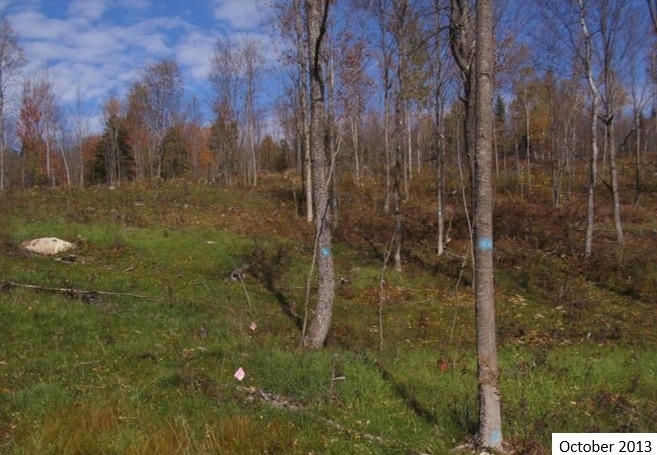 Remaining tasks are to sample forage productivity, understory plant composition, epicormic branching, and soil properties in 2014. Preliminary results of this work will be presented at the second Northeastern Silvopasture Conference in January 2014 and additional meetings in 2014 and 2015. A farm tour will also be held in 2014. As mentioned previously cattle were held from the site until the soil conditions dried out. Due to this, forage production was only sampled during August just prior to grazing. 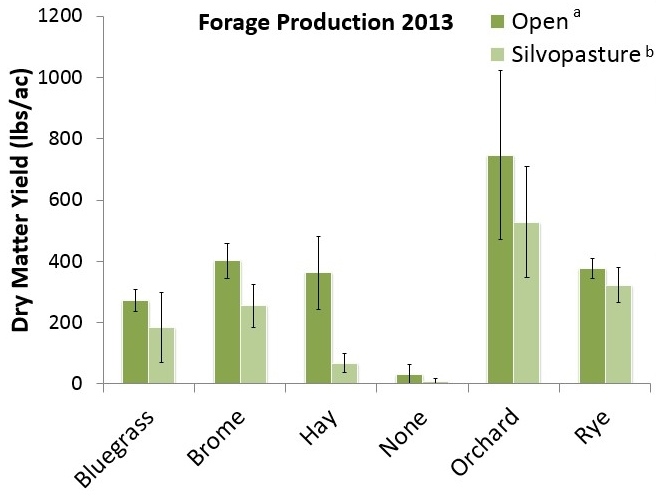 Forage production results were analyzed using Program R (a free statistical analysis computer program) and the open pasture treatments produced significantly more forage (all forages combined) than silvopastures. This may be due to light acting as the most limiting factor in silvopastures during wet years. The split plot treatments were beginning to diverge in 2013. Forage production in strips where no forages were seeded was significantly low. 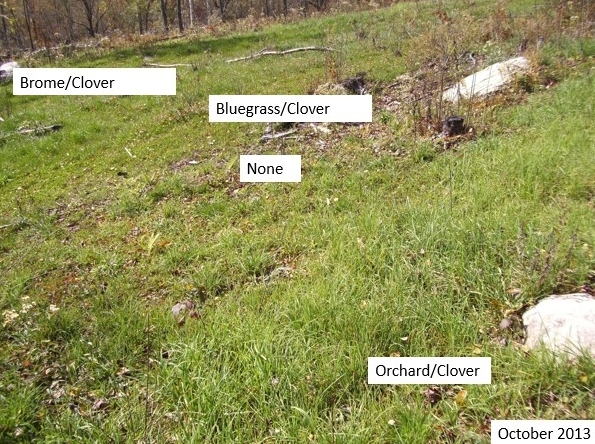 Orchard grass and perennial rye-grass treatments mixed with white cover produced the greatest amount of forage. These results are best described in the attached figure. As results of this project are still very preliminary, they have not generated new ideas or a change in the tract about silvopasture establishment. It was unexpected for silvopastures to produce significantly less total forage than open pastures, but this is logical due to ample soil moisture in 2013 allowing light to be the most limiting factor over growth (although this relationship needs to be tested directly). Being the first year after establishment, the results in 2014 will be far more valuable, especially in how these pastures respond to repeated grazing.